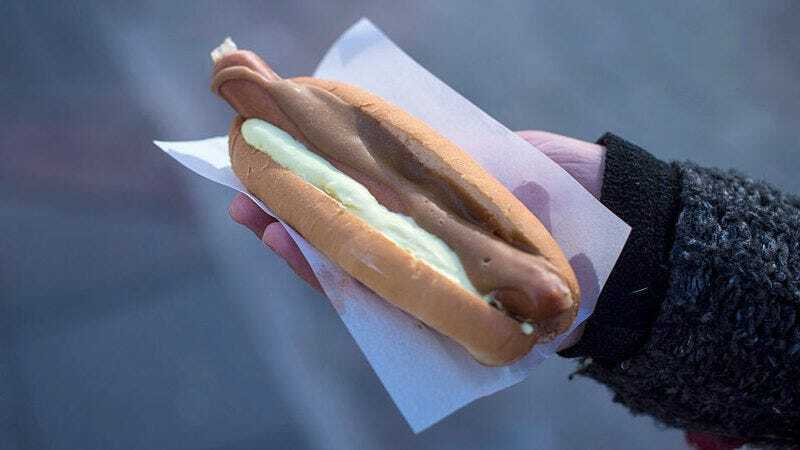 Does Iceland really have the best hot dog in the world? In Fran And Cameron Eat On The Company Dime, The Takeout staffers Fran Hoepfner and Cameron Scheetz eat on the company dime. This week, our resident critics return from a trip to Iceland, where they experienced the country’s love affair with hot dogs. Fran Hoepfner: When we were making plans for Iceland, we solicited advice from just about everyone we knew—because it does feel like a place that every person in their 20s is going on vacation right now—and pretty much everyone told us we had to get the hot dogs there. Am I remembering correctly? Cameron Scheetz: Oh, yes, correct. And I was a bit perplexed by this. I mean, I consider myself an adventurous eater, to some degree, so I was looking forward to this trip as an opportunity to expand my palate, if you will. I was eager to try something different! But, by all accounts, the hot dog is a national point of pride—an almost universally beloved dish synonymous with local cuisine—and who am I to say no to 320,000 beautiful, tall, strong-boned Icelanders? We were certainly eager to try the Icelandic frank, though we didn’t end up getting around to it until the last day of our journey. FH: It felt weird to prioritize a hot dog, to our credit, a thing I maybe only otherwise prioritize if I’m at a baseball game, but yeah, our final morning of the trip we went to Bæjarins Beztu Pylsur—Bæjarins Beztu for short, obviously—which translates to “the best hot dog in town.” It’s just a little stand right in the center of Reykjavík, the capital city of Iceland, that’s been open since 1937. It’s also not just a tourist trap: The day we went the line was full of a healthy mix of tourists and locals trying to get their dog on. CS: An unassuming spot if it weren’t for the line of people at the counter all times of day—a constantly moving line, mind you, but a line nonetheless. So we queued up, and it wasn’t long until we were face-to-face with a burly, Icelandic hot dog slinger and an admirably simple menu of two items: “pylsur” and “gos” (soda). My kind of place. We each grabbed a dog and a drink, then parked ourselves at one of the few picnic benches near the stand, delightfully adorned with little wooden hot-dog holders. Again, Bæjarins Beztu knows the way to my heart. The first thing I noticed before biting in was how robust and appealing the whole thing looked—the warm, fluffy steamed buns are a far cry from the straight-from-the-bag variety of your typical Midwestern concession stand. As we took our first bites, what stood out to you? FH: Well, I have to admit that I was a little apprehensive because the hot dogs were boiled. I share your Midwestern upbringing, and boiled hot dogs feel like a dashed-off dinner on a night without anything else to eat, especially compared to the big, chargrilled ones that feel so en vogue these days. And while the look might have been attractive for you, I have to admit its general appearance—a hot dog more or less slathered in sauces—wasn’t as immediately appealing for me. Regardless, I went for it. The initial bite has a clean snap to it, as boiled casings often do, and maybe a slightly saltier taste than a normal American hot dog. There’s a little bit of lamb in the Icelandic dogs, which I couldn’t necessarily identify without knowing ahead of time, but it is a great twist on an old classic. And then I have to admit I really fell in love with all of the onions! Two different kinds of onions! Raw and fried! I was in onion heaven, to be honest. CS: We can safely proclaim onions the MVP of the Icelandic dog, especially the fried ones, which provide a crunchy bed for the meat to rest on. And it’s all topped with a trio of sauces, including a gravy-looking spiced brown mustard and pickled remoulade. That gave the pyslur a heavier feel than your traditional American frank, with a savory heartiness that’s an ideal treat for the world’s northernmost capital city. Oh, and there’s just a dash of ketchup for some tang, which was not nearly as blasphemous as it might sound to our fellow Chicagoans. CS: Oof, I know. But it really is a team player here. I think Iceland makes the case for it. Please don’t send me hate mail for this. All in all, I was enamored with the hot dog. Reykjavík in the spring is a chilly place, but the pyslur made me feel warm and fuzzy inside. I certainly understood why the locals were so proud. What’d you think overall, Fran? Was it, as The Huffington Post posits, the “best hot dog in the world”? FH: Oh man, the pressure is on. Okay, okay. “Best hot dog in the world,” definitely not, but “incredible snack to eat at 11 in the morning with your pal on vacation,” hands down, absolutely, 100 percent. While it might not be as obscure or rare as other types of food in Iceland, there’s a deep, resounding comfort in enjoying a food simultaneously familiar and new.